Travel – is an important part of human nature and a useful educational tool. It is an integral part of the teaching and learning process. Learning experience such as school trips, excursions and field trips expose children to a ‘real life’ situation of what has been taught in the classroom, thereby learning leaves a lasting impression on the children. 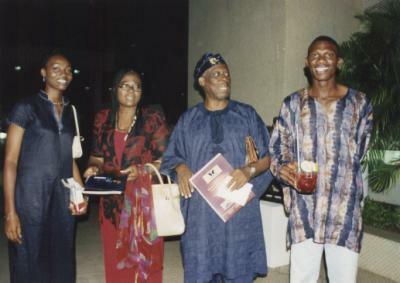 Young minds should constantly be exposed to travels to boost and enrich their intellectual base and worldview.Regrettably over the years, this part of an important learning method has been neglected due to a number of factors leading to an army of half-baked students with a very limited worldview. 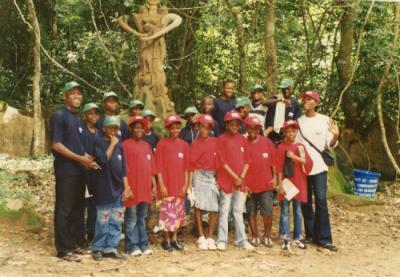 To this end, educational tours are packaged for children to expose them to adventures, discoveries and experiences of tourist destinations. 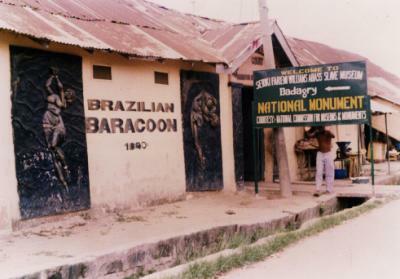 When one feels inclined to take a trip back into history, a visit to Badagry is most compelling. 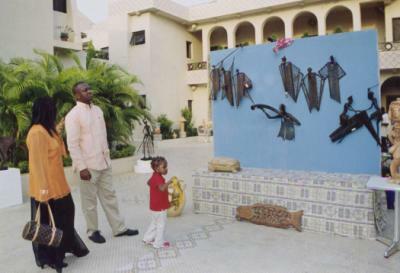 Here, one can see the rich collections of relics of slave trade such as weapons, cultural artifacts and instruments associated with the slave trade. 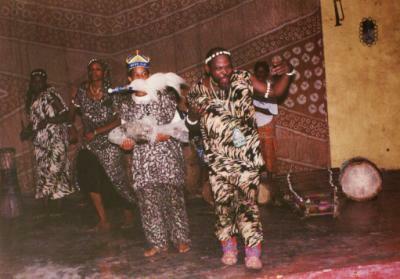 These historic sites indeed unravel and relive Badagry’s past in bold relief. The geographical area of Badagry allures with beautiful topography as well as bracing beaches which jut into the Atlantic Ocean. Its long coastline stretches far distant into horizon, snugly hedged between Lagos Lagoon to the north and Porto-novo in Benin Republic to the south. It is an international border town brimming with people and crisscross of activities. Its beauty, value and education remain yet untainted. 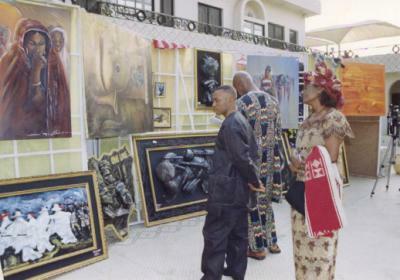 Badagry is a varied land both from the geographical and scenic points of view. It has 67 kilometers shoreline – alluring beaches of soft white sand and beautiful landscape. 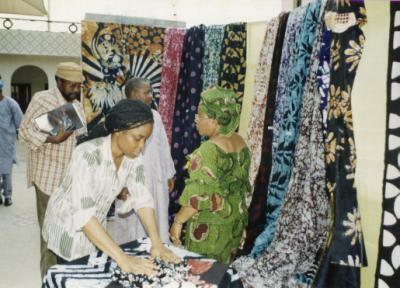 Osogbo is the capital of Osun State, “State of the Living Spring”, Southwestern Nigeria. It is some 88 kilometers by road Northeast of Ibadan. 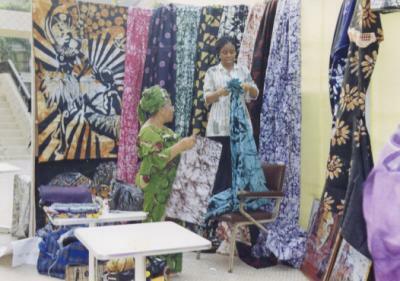 It is also 100 kilometers by road South of Ilorin and 115 kilometers Northwest of Akure. It is situated on Latitude 9.7°N and on Longitude 4.5°E. Osogbo city seats the Headquarters of both Osogbo Local Government Area (Osogbo South) and Olorunda Local Government Area (Osogbo North). 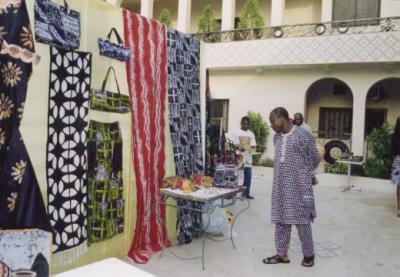 Osogbo people are famed for their commercial activities in handmade, traditional woven cloth "Aso Oke" and Batiks, same with cloth-dyeing, embroidery, pottery, goldsmithing. 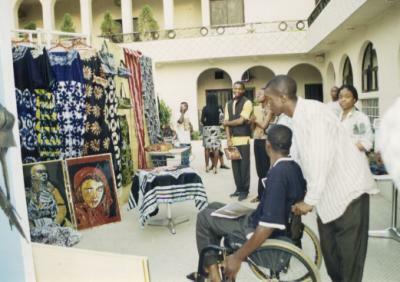 In addition Osogbo people are renowned, worldwide, for their unique creations of art works of different cadre; Painting, Carving, Bead-works, Sacred artworks and even performing arts. 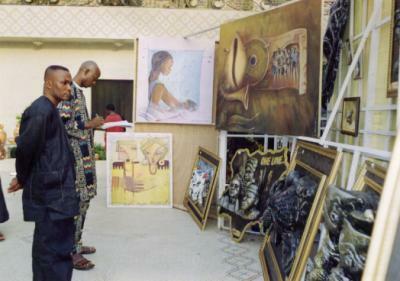 Need to say this ever-increasing fame in contemporary African arts has shot Osogbo to a prominent spot in the world map -as far as Arts and Antiques collections is concerned. One of the many awesome works that dot inside the Osun groove and courtyard. The children arrived at Osogbo after an eventful journey that took them through the historic city of Ibadan and the beautiful landscapes that dotted the entire length of the journey. 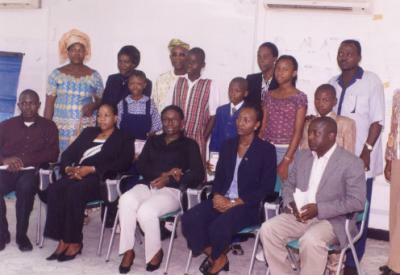 The first port of call was NTA Osogbo where the celebration of this year children’s day was in progress. 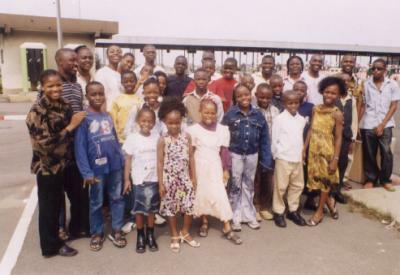 The children quickly joined in and had a live performance in the NTA studio at Osogbo. 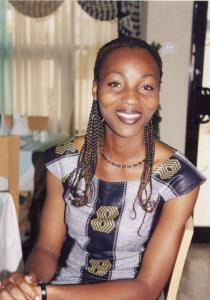 The General Manager of NTA Osogbo. Engr. Ben Adedire took them round the unique station built on a hill over looking the ancient town. The children had an exciting time as they listened to the General Manager’s explanation of how the station operates. 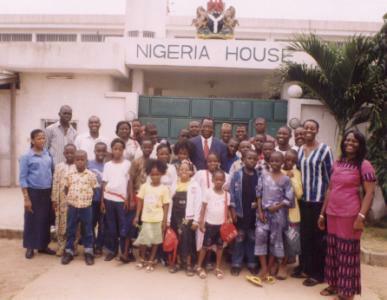 After the tour of NTA Osogbo, they retired into the Zarah Guest house, a first class facility in the town. The children fresh from their siesta which they observed after the exhaustive journey conveyed into the expansive restaurant of the hotel for dinner and had a night of fun. They were briefed on what to expect for the next two days of the tour. 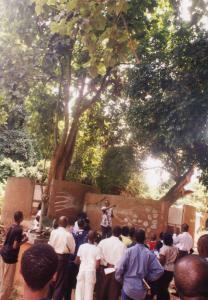 As the night wore on, they engaged themselves in storytelling, folktales, poems, recitation and singing. It was very educative. The second day of the tour began with a light breakfast at the hotel. The children then set out in the comfortable Lagos State Waterfront and Tourism Development Corporation couch bus to the first itinerary of the day, The Osun Groove. 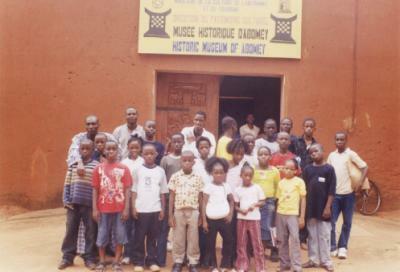 This is the birthplace of ancient Osogbo history. This historical and educative groove in the heart of the town houses the relics and history of Osogbo people. The pupils were introduced to the history of the town and the tour guide traced the ancestral lineage of the Osogbo people to modern times. 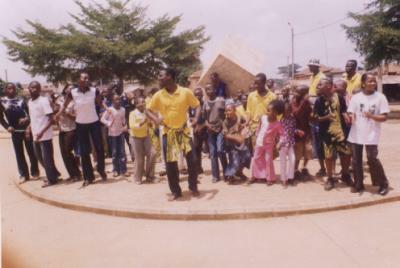 The high points of the visit to the Groove, which held the attention of the children, were the ancient artwork and the Osun River that runs through the Groove. 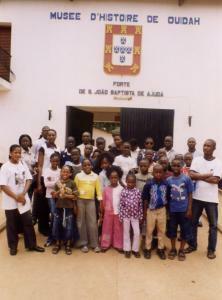 The children were also fascinated by the ancient Palace of Olutimehin (the First King of Osogbo). The suspended bridge was breath taking to the young tourists. 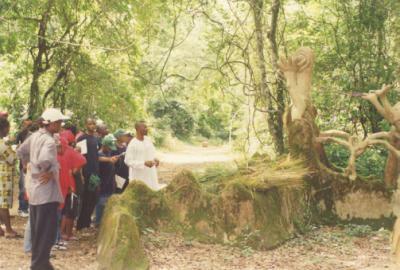 The statues of Ela, Obaluaye, Sopono, and Osun-the goddess of fertility were an educative encounter for the pupils. 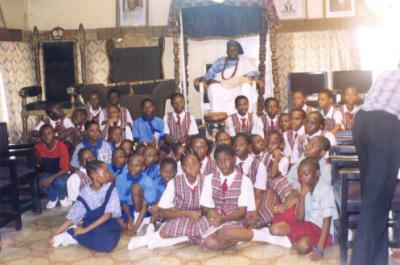 The pupils were excited at the mention of Mrs. Susan Wenger the Austrian who is the custodian of the Osun deity. 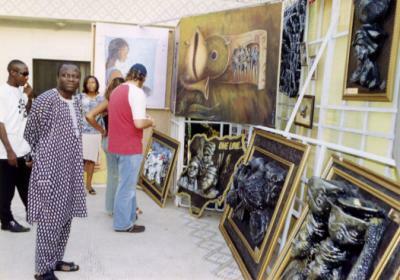 The next visit took the young tourist to the Nike Art Gallery- here they saw contemporary Osogbo arts in painting, designs, batik, sculpture just to mention a few. They also visited the Tie and Dye section of the gallery. Later in the evening, the Kawawa RAO Center provided the entertainment that capped an eventful day. 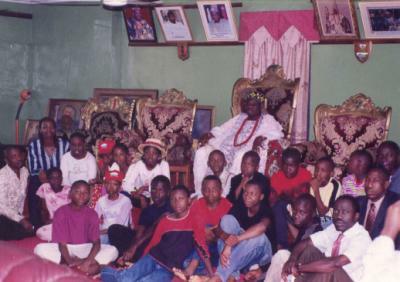 At the Kawawa Center, the children mingled with other children from Osogbo and its environs and were treated to exotic traditional dances, poems, incantations, drums and drama. 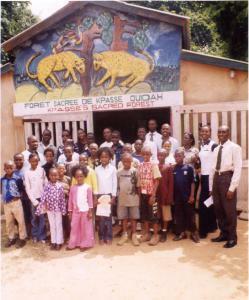 It was very memorable for the children. 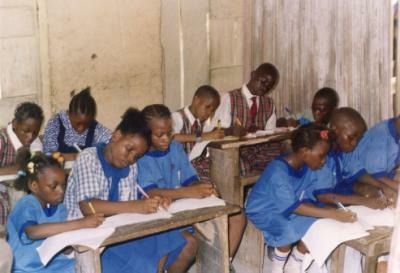 The children later did a test that assessed what they learnt about the tour and facts about the sponsors; Oceanic Bank. The day began as usual with the children having their breakfast. 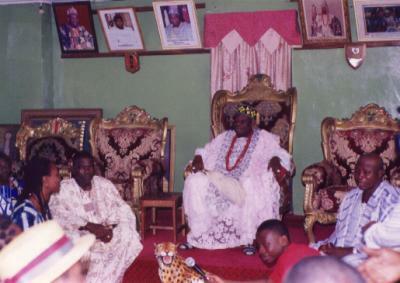 The tour drew to an end with the visit to the palace of Ataoja of Osogbo, Oba Iyiola Matanmi. The royal visit exposed the children to the importance of the traditional institution. The palace courtiers, the gong heralding the Oba was fascinating to the children. 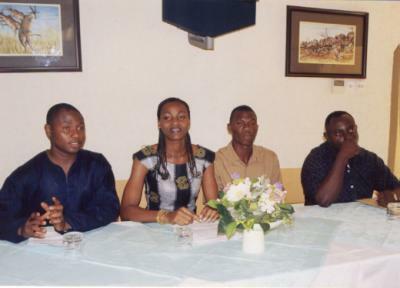 They learnt a short history of the Obaship institution in the state. 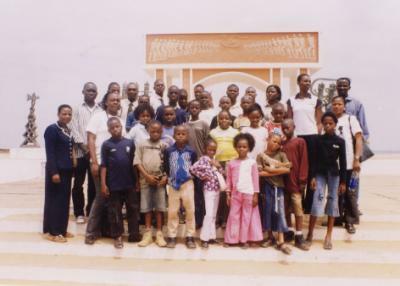 On the whole the trip to Osogbo was an educative one for the pupils. Sponsored by: Oceanic Bank International Plc. 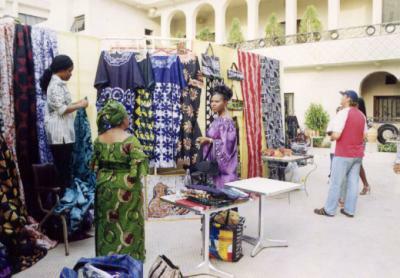 Benin Republic (Dahomey) is one of the countries under the Economic Community of West Africa State (ECOWAS) with its capital in Cotonou Port Novo). 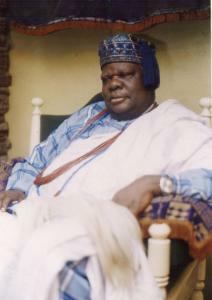 It is an interesting country with strong cultural and historical links with Nigeria, which bordered it to the east. 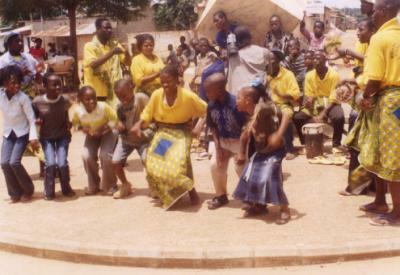 Benin’s West Africa heritage offers numerous attractions for discovery for us. We found a microcosm of Africa’s wonders, rhythmic parks and natural reserves, varied animal life and changing landscapes and beautiful handicrafts, and most importantly a warm, hospitable people. 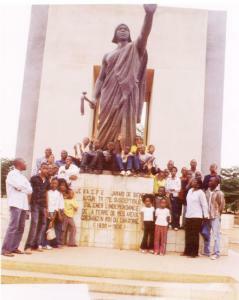 The children found Benin’s strong historical base very fascinating. Benin is home to the ancient palace ruins of the kingdom of Dahomey one of West Africa’s former great empires. © 2005 The Tour Shop . All Rights Reserved. This site is Powered by Tripod & Global Access Streaming.